Street Kids come for feeding and classes sniffing Shoe Glue. Street Kids Being Fed at Our Temporary Shelter. The first step towards rehabilitation. Street Kids being taught how to read and write. 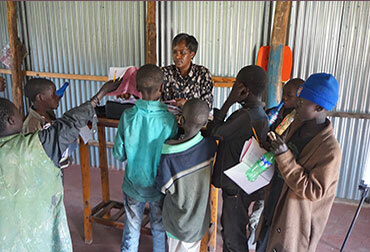 Mrs. Carren Wagongo teaches them how to read and write. Mrs. Carren checking the kid's work. Our Orphanage Home that is under construction. Children under the care of Emmanuel Orphanage Home. We are pleased to share with you about the vision God gave me and my wife to provide a home, food, clothes and a bright future to the orphans under the foundation based on God’s word. With your sponsorship, we are doing our best to make sure that Children at the Emmanuel Orphanage home are encouraged to fulfill their dreams through education. Orphans under the care of Emmanuel Orphanage Home in their dormitory at a rented apartment. Construction of our orphanage is near completion. We need support to finish the interior. We provide food for street children and orphans. This provides us with an entry point of getting the children to our orphanage and take them out of the streets. 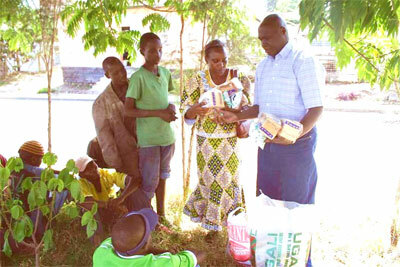 The Emmanuel Orphanage Home is a place of refuge for many orphaned children within the region. The orphans are from the ages of 6 to 18 years. Most of them from the streets in urban centers and some from surrounding slam areas, especially from grandparents who are not in a position to assist them in any way. At the moment, the home has 21 orphans staying at the rented apartment, where 10 are boys and 11 are girls. The home intends to be a blessing to about 200 orphans in the future. The Emmanuel Orphanage Home has a vision of working with our partners and stakeholders to achieve these objectives in our mandate.